ThemeParkMama: ModCloth Week of Love Photo A Day Challenge Ends on Valentine's Day! 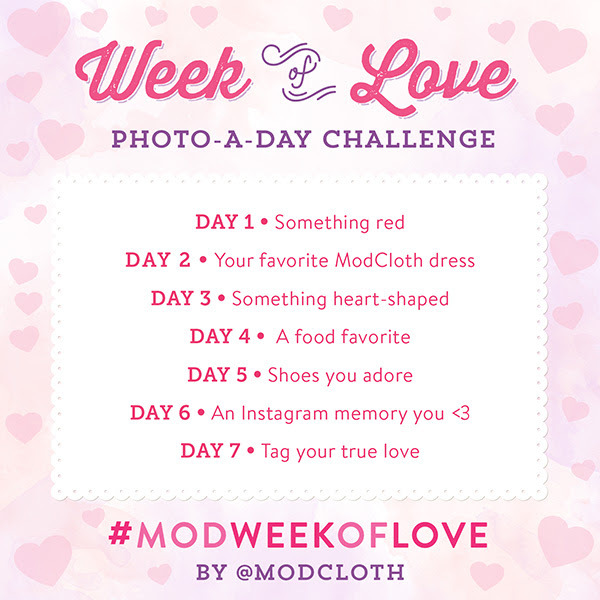 ModCloth Week of Love Photo A Day Challenge Ends on Valentine's Day! #MODWEEKOFLOVE by ModClothLove is in the air and in the spirit of Valentine's Day ModCloth is asking their Instagram community to participate in a love-inspired ModCloth Instagram Challenge Simply follow the schedule in the image below, tag your photo's with #modweekoflove @ModCloth and share the things you love the most with the ModCloth community! Submit as many photo's as you like and Happy Valentine's Day!